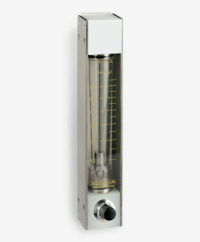 Model KD flow meters are durable, reliable instruments for measuring liquid and gas flows in industrial applications. The impact-resistant polymer flow tube is protected by stainless steel (AISI 316) casing, and the inlet features a flow adjustment valve. Special construction options include alternative liquid and gas scales, Viton® or EPDM seals, quick-change flow tube fittings and high/low flow alarms. Simply call our team for more details and to discuss your requirements. Similar products in this range include the Model K and Model KL.